This Handheld Folding Metal Detector owns a portable and foldable design, which makes it easy to adjust and convenient to use. Besides it owns automatic tuning and audio alert, in this way it lets you know the condition immediately. And it can be used widely used for places like airports, railway stations, docks, prisons, customs and frontier defense as well as quality control of medicine, food and other commodities for security use. An On/Off Switch is used to control it and its sensitivity can be adjusted by the Switch Sensitivity Adjuster. 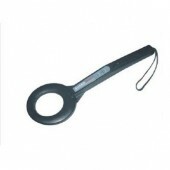 The working voltage of this handheld folding metal detector is 9V.The operating frequency of it is 25KHz and the indicator can be seen by the Red and Green LED. What’s more t you can choose from the sound and vibration. If you want to know more details you can come to detectorall. We will offer you with high quality and reasonable price. So seize the chance and add one to your chart. As an old customer of your, i think that your product is really excellent with both good quality and sound price.